Ingersoll Rand announced the debut of its new HandPunch GT-400 time and attendance terminal that lets employees clock in with the same card used to enter their building facilities. The MTR-G embedded reader module provides compatibility with aptiQ smart credentials, which provides advanced MIFARE Classic and MIFARE DESFire EV1 encryption, to provide improved security. It also reads HID proximity, GE/CASI Proxlite, AWID proximity, Lenel proximity and popular 13.56 MHz smart cards; so companies do not have to switch out their installed card readers. Health care/Long-Term Care – The HandPunch enables health care facilities to track multiple shifts accurately, while protecting the security of the patients and visitors by verifying that the staff present is who they say they are. Hospitality– Frequent staff changes and multiple shifts can easily be managed with the HandPunch, while also ensuring high security wherever it’s needed by verifying that the staff present is who they say they are. Government – Frequent staff changes and multiple shift schedules are no problem for the HandPunch. In fact, its accurate time and attendance tracking can help reduce the number one expense in governmental organizations – labor. Grocery – Frequent staff changes and multiple shift schedules are no problem for the HandPunch. In fact, its accurate time and attendance tracking can help reduce your number one expense—labor. If the organization presently uses proximity cards but wants to upgrade to smart cards, users of the HandPunch GT-400 + MTR-G embedded reader module will not need to make any hardware changes to the hand reader because it is compatible with both. 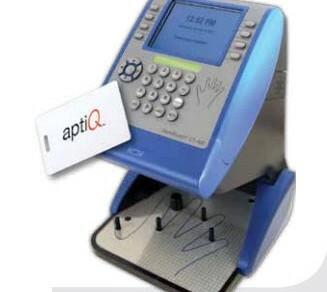 Additionally, if upgrading to aptiQ smart card technology, which is already NFC enabled, users will eventually be able to use their own smart phones as their credentials.